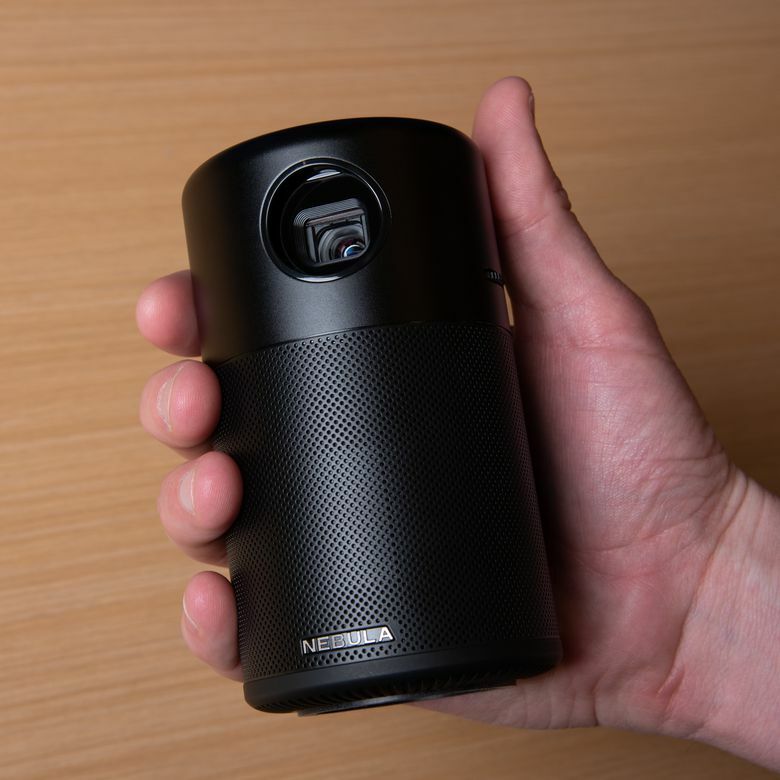 Though its relatively large speaker is a bit underwhelming, the Nebula Capsule is the clear winner in premium portable projectors thanks to its intuitive Android interface and wireless connectivity. A little over a year ago Anker Nebula successfully crowdfunded an all-in-one mini projector with the same size and shape as a can of soda. With over $1.2 million raised, the Nebula Capsule was born. The Anker Nebula Capsule features a unique design that’s both portable and powerful, and takes advantage of modern app connectivity, Bluetooth speakers, wireless screencast, and an Android operating system to offer an impressive suite of form and function. We can guarantee you’ve never seen a projector quite like the Anker Nebula Capsule. Measuring 4.72 inches tall with a diameter of 2.67 inches, the uniquely designed cylinder is literally the same size as a can of soda (or beer), making it easy to stick in a bag, purse, backpack, or almost anywhere you can fit a can or bottle of water. It weighs just under a pound but feels durable enough to throw loosely into a bag, provided nothing scratches the glass over the recessed lens. A 360-degree, 5-Watt speaker engulfs the entire bottom half, leaving just enough room for the HDMI and micro USB ports in the rear. The top half includes the lens, a manual focus adjusting knob, a large air vent, as well as the infrared receiver for the included remote control. The top surface area of the “can” features a single large, circular button that can be pressed in four different directions for different functions: Power, Volume Up, Volume Down, and Bluetooth speakers On/Off. In the middle of the circle the word “Nebula” glows blue when in use, red when charging, and green when fully charged. The packaging for the Nebula Capsule is impressive and befitting of its modern approach for the tech-savvy consumer. The box folds out into some nice artwork featuring the Capsule in an outdoor setting while it rests inside protective foam padding. A static-free cloth is included for lens-cleaning, as well as a mesh bag to help store the device. The cables include the standard micro USB charging cable as well as a USB OTG cable for connecting USB storage drives through the micro USB port. Setup is quick and easy, as the Capsule comes loaded with the Android 7.1 operating system, organized into large, intuitive tiles. If connected to Wi-Fi, you’ll want to update the firmware, which is easily done from the Update menu under Settings. Navigating the Android interface is simple using either the included infrared remote control, or the optional Nebula Connect app, freely available for iOS and Android smartphones. We had zero issues quickly installing and connecting the app over Bluetooth. The Android ecosystem, along with the optional Bluetooth connected smartphone app for remote control, helps make the Nebula feel like a truly modern device. After installation you can use the Nebula Connect App as a remote control for the projector, easily controlling volume, and switching between touch screen mouse and controller modes. Some of the downloadable apps, such as Netflix, require the use of the mouse function of the Nebula Connect App to navigate. The included remote feels cheap and basic by comparison. For a portable projector, the Anker Nebula Capsule is one of the more powerful we’ve seen, sporting 100 ANSI Lumens. You’ll still want an area as dark as possible for the clearest picture and greatest color contrast, but in dimly lit rooms the Capsule performs admirably with its 400:1 contrast ratio and DLP image technology. With only a 480p native resolution, watching videos via the Netflix app will never look as nice as an HDMI-connected Blu-ray player. Two brightness settings are offered: Standard and Battery Mode, with the latter, slightly dimming the brightness to preserve battery life, which was perfectly serviceable in dark or dim areas. Color options are limited to Normal, Warm, Cool, though both contrasts offer rich color saturation. We tested the image quality at multiple throw distances. The Capsule has a recommended throw distance of 23 to 121 inches. In ideal dark conditions, a 100-inch distance provided a clear 80-inch image size, though the HDMI-sourced videos are noticeably superior, while a more manageable 64-inch screen can be obtained with a distance of about 60 inches, or five feet. The Anker Nebula Capsule features a unique design that’s both portable and powerful. That omnidirectional speaker takes up a large amount of real estate on the Nebula Capsule and is used as a major selling point, including functioning as a wireless Bluetooth speaker. Unfortunately, we came away underwhelmed. The sound quality from the 5-watt speaker certainly isn’t bad; it’s clearly better than most projectors whose tiny built-in speakers are almost an afterthought, and definitely fills up a large room with the volume raised. But it still doesn’t stack up to a dedicated external speaker. The sound quality is about on par with a Google Home Mini. The speaker runs into major sound breaking issues when cranked to max volume, particularly with big action noises like explosions and loud music. The speaker runs into major sound breaking issues when cranked to max volume, particularly with big action noises like explosions and loud music. We had to keep the volume at around 80% to avoid any distortion or other sound problems. The other sound issue is the fan - it’s quite noisy. The noise is comparable to that of a desktop PC running a video card with a dedicated fan. At around 50-60% volume the sound usually drowns it out, but it can be an issue if you’re sitting near the capsule. The Nebula Capsule comes loaded with Android 7.1 operating system, though the only pre-installed app is Aptoide TV. The menu is incredibly easy to navigate, providing quick buttons to jump back and forth between the HDMI source, peruse downloaded apps like Netflix and Amazon Video, explore any connected USB storage devices, and tweak screen settings such as rear or ceiling-facing. The menu screen also clearly displays the battery charge in the upper right corner as both a bar and percentage, like a smartphone. The Capsule includes 8GB of storage space, with the OS taking up about 3GB initially. The Android ecosystem, along with the optional Bluetooth connected smartphone app for remote control, helps make the Nebula feel like a truly modern device. The only drawback is the sketchy offerings of the Aptoide TV instead of the Google Play store, which vastly limits the kind of gaming apps you can load onto the projector. Lack of Google support also means there’s no way to actually log into the YouTube app, in case you want to keep up with your subscriptions. With most handheld portable projectors retailing for $200-$250, the Anker Nebula Capsule is one of the more expensive portable mini projectors you can buy at $350. Cost in projectors is commonly tied to the brightness of the image, and you can find better picture quality in the $499 AAXA P300 Pico Projector with 500 Lumens and a 1280x800 resolution. However, the Nebula Capsule does include lots of welcome modern features such as the Android OS, instant wireless connectivity and the easy-to-use mobile app controller, as well as a very impressive 4-hour battery life. The Capsule’s 100 ANSI Lumens also produces a brighter picture than its cheaper competitors, and the Bluetooth speaker option is a nice bonus - if you don’t already have a better one. The Anker Nebula Capsule’s hefty price tag puts it a cut above budget and portable projectors, though the image and sound quality isn’t quite the leap up you may be expecting when compared to the Apeman Projector M4 ($199). Likewise, it lacks the brightness power of bigger and bulkier devices like the Elephas LED Movie Projector ($99). But the Nebula Capsule comes equipped with an entire Android interface easily integrated with popular apps like Netflix and Amazon Video, and features wireless connectivity to make it the superior choice for a portable projector. Want to take a look at some other options? See our guide to the best outdoor projectors. This is a premium portable projector that’s full of features. The Anker Nebula Capsule is not only one of the more powerful portable projectors, it also provides one of the most complete packages on the market. Its laundry list of features includes everything a modern projector should include and more, from an intuitive menu interface to auto Keystone correction, painless wireless connections, and remote app, and a Bluetooth speaker mode, all while providing four hours of crisp, clear image projection. Product Dimensions 2.7 x 2.7 x 4.7 in.